We are very proud of our students and staff and their accomplishments, so we’ve created this page to use our bragging rights! Here you’ll find all the latest news about what our Hawks have been up to, from honors and athletic victories to upcoming events and performances. You will also find helpful and informative articles written with student success in mind. Stay tuned! This training is for adults who work with or parent youth, teens, and young adults ages 12 through 20. There are only 30 seats available. 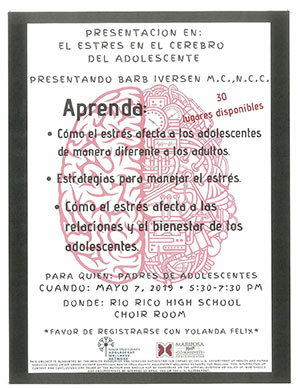 Please contact Yolanda Felix at 520.375.8717 to register. Esta capacitación es para adultos que trabajan con o padres jóvenes, adolescentes y adultos jóvenes de 12 a 20 años de edad. Solo hay 30 asientos disponibles. Por favor, póngase en contacto con Yolanda Felix en 520.375.8717 para registrarse. Did you know that Joint Technical Education District (JTED) is starting a Heating, Ventilation, and Air Conditioning (HVAC) program at the Green Valley Cooling and Heating training center this upcoming 2019-2020 school year? 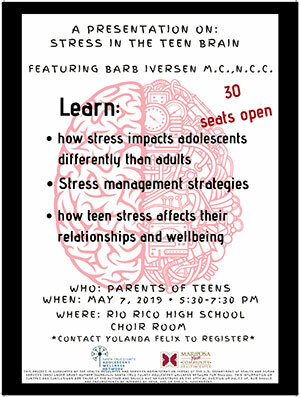 We are looking forward to offering this program to Rio Rico High School students! For more information about this great opportunity, please visit our CTE page. There is no school on Friday, April 19 and on Monday, April 22. School resumes on Tuesday, April 23. Enjoy your holiday weekend! Attention, 9th grade families! Please join us for coffee with the counselors on Thursday, April 25 at 8:00 a.m. We look forward to seeing you there! The civics test is a graduation requirement from the state of Arizona. Students must score 60% or higher to pass, and we will mail home the results from this test. Visit the United States Citizenship and Immigration Services website for an official list of the 100 civics questions on the naturalization test and free study materials in English and Español. Santa Cruz Valley Unified School District No. 35 invita a sus familias a clases de inglés cada lunes y martes de 6 a 8 de la tarde en el salón 806 de Rio Rico High School. Las clases son gratuitas y el curso termina en mayo del 2019. 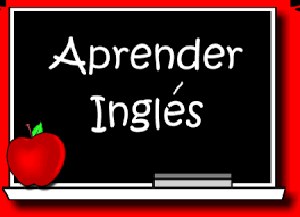 Esta clase mejorará su comunicación verbal y escrita en inglés, incluyendo el uso de la tecnología para la comunicación con la escuela. ¡No deje que el idioma limite su participación en la educación de su hijo o hija! Do you need help with homework, English, or math tutoring? If so, join Hawk tech. Morning tutoring is available on Tuesdays from 8:00 to 8:50 a.m., Wednesdays from 8:00 to 8:30 a.m., and on Thursdays from 8:00 to 8:50 a.m. Afternoon tutoring is available on Mondays, Tuesdays, and Thursdays from 3:45 to 4:45 p.m. After school snacks are available, as well as a 5:20 p.m. bus on Mondays, Tuesdays, and Thursdays. Please see our Hawk tech tutoring flyer for additional details. INROADS is a nationwide organization that started 46 years ago. We specialize in a leadership professional program for college students to provide a pipeline of talented, young, diverse leaders. The program is comprised of a paid, professional summer internship experience, mentoring, and coaching, community service, and leadership development training. Our ultimate goal is to have these students receive a full-time job offer upon graduation from their sponsoring company. Our mission is to help those under-served students get access to professional experience. Please see the recruitment flyer for additional information. 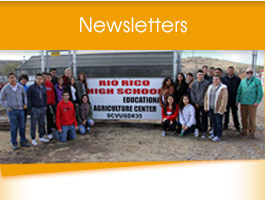 Miss one of our recent newsletters? Here we’ll keep an archive for your enjoyment.